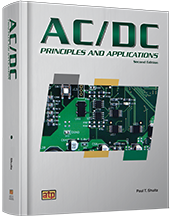 AC/DC Principles and Applications teaches learners how to apply basic laws and analysis techniques to traditional introductory circuits, as well as popular, real-world AC and DC circuits. AC/DC Principles combines standard theory of electricity with fundamentals of electronics and demonstrates electronic theory as applied to actual applications. Throughout the book, only those circuit theorems and analysis techniques that are practical and typically used in real-world circuit analysis are addressed. In addition, Kirchhoff's current law, Kirchhoff's voltage law, Thevenin's Theorem and Ohm's law are introduced to ensure that the learner has a complete understanding of each law before attempting to apply all or part to traditional series and parallel circuits.